Olympos (or Olymbos) was almost completely isolated from the outside world for centuries, but no longer, yet the feeling of isolation is still there. From the port of Diafani it is about 8 kilometres to Olympos. It will be a little while before the village turn up, and once it does, it is not without losing your breath. 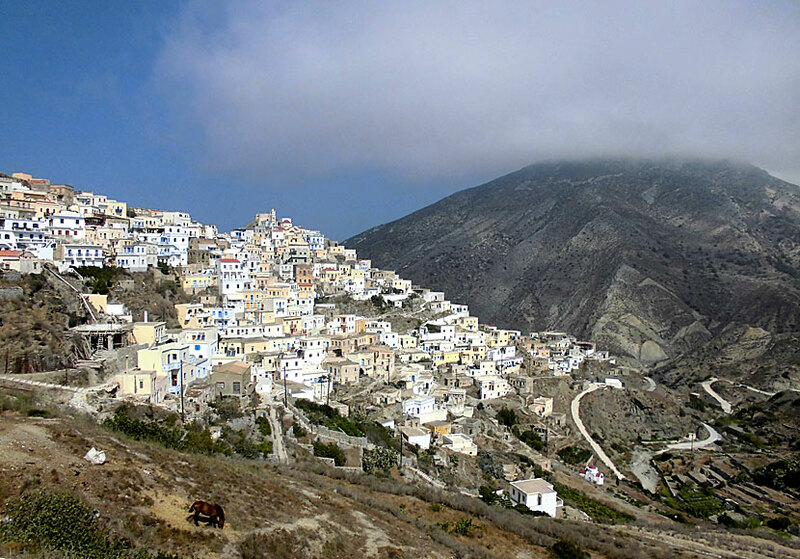 I have seen many beautiful Greek villages from a distance, but nothing beats the view of Olympos. Such is certainly the feeling when the bus rounds the last corner, and the village suddenly appears in the distance. Fantastic one burst out, there is the so mythical village. For real! But is it a castle in the air? Do Olympos live up to its reputation or is it like The Emperor's New Clothes? As I stood there in the curve and for the first time looked out over the valley and the spectacular village, I felt a certain scepticism. If you deviate from the main street you meet another Olympos. For long I had dreamed of going to Olympos, just as I had dreamed of seeing Meteora on the Greek mainland. Meteora more than lived up to my dreams, but Olympus did so only partially. For example, I had not thought that I would be greeted with happy Kalimera from parrots in cages, nor that some tavernas had barkers or that old women in traditional costumes would sell plush toys in the shape of giraffes and frogs. 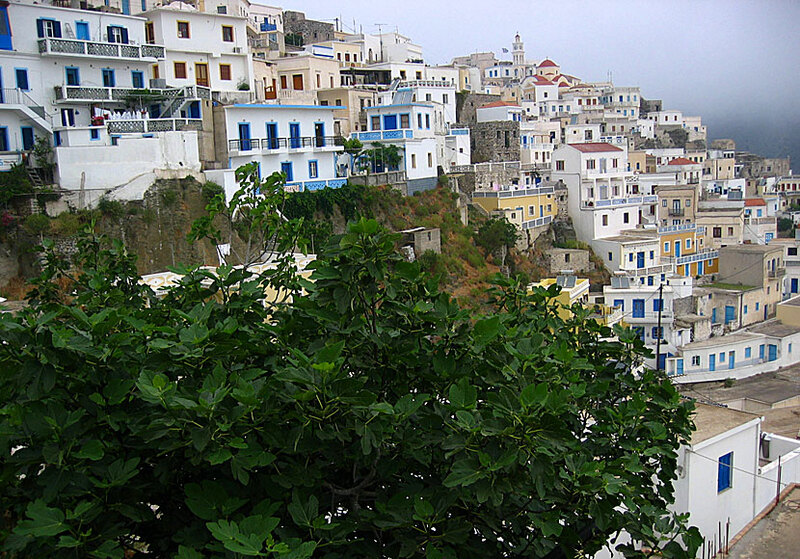 The village was built between 600 and 800 AD as protection against pirates in an inaccessible area. The houses were built in natural stone and go well with the surroundings, which made discovery difficult. Today are many of the houses painted in bright pastel colours, the insulation has been broken for a long time and tourists have taken over the pirates' role as intruders. 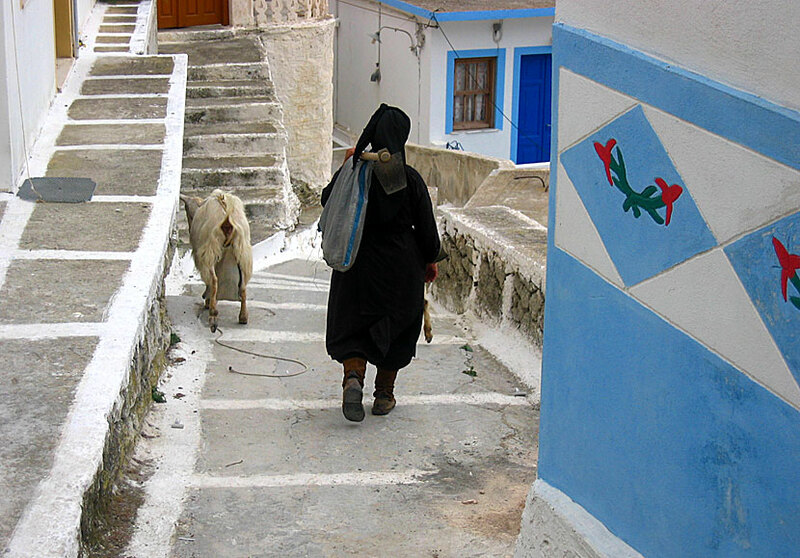 Despite the large flow of tourists, Olympos still belongs to one of the most worth seeing villages in Greece and is often called a living folklore museum. To some extent it is true, for example do many women still wear traditional costumes, but Olympus is also a tourist trap. There are those who will be greatly disappointed, the narrow main alley is lined with sellers trying to sell the same junk like the souvenirs shops do in Pigadia. But if one deviates a little from the main alley and aimlessly stroll around in the labyrinthine alleys a new world will open, a world that is found to be in a completely different era. There are many tavernas to choose from, which one that is the best is difficult to say, most have the same menu. Instead, the location have to determine, several stands insanely beautiful with sensational views over the valley, or overlooking the sea. Next to two windmills on the side of the village facing the sea lies one good taverna where the food is prepared in a stone oven, just like in olden times when all houses in Olympos had a oven outdoors. Preparing of Makarounes in Olympos. 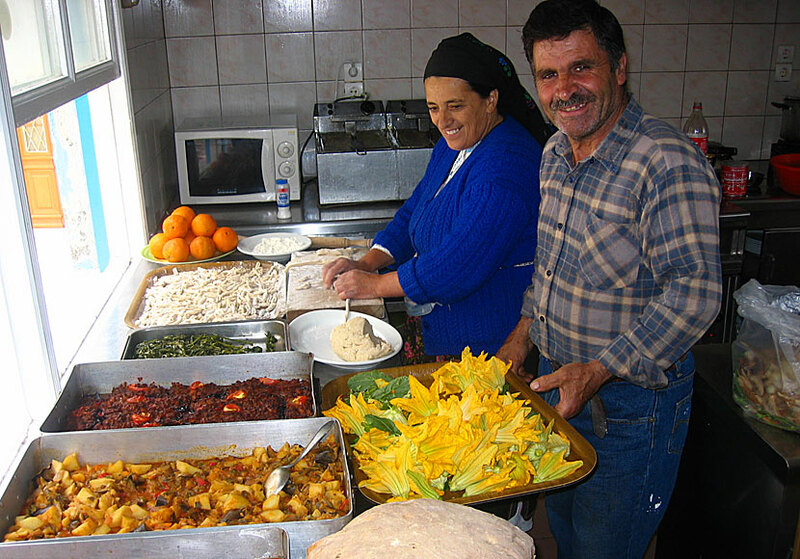 Olympos' specialty is Makarounes, a hand-rolled fresh pasta mixed with onions and cheese. It is served on all the tavernas, including at Restaurant Olympos which in my opinion is one of the better tavernas in the village. Restaurant Olympos lies along the main alley at the very beginning of the village. Although one initially might be a little disappointed of Olympos, the village's beauty and mysticism will improve as time is getting on. But you have to deviate from the tourist areas, like to go up to the windmills and gaze out over the surrounding area, absorb the views, close your eyes and draw on your imagination. Visualize that people lived this isolated during hundreds of years. 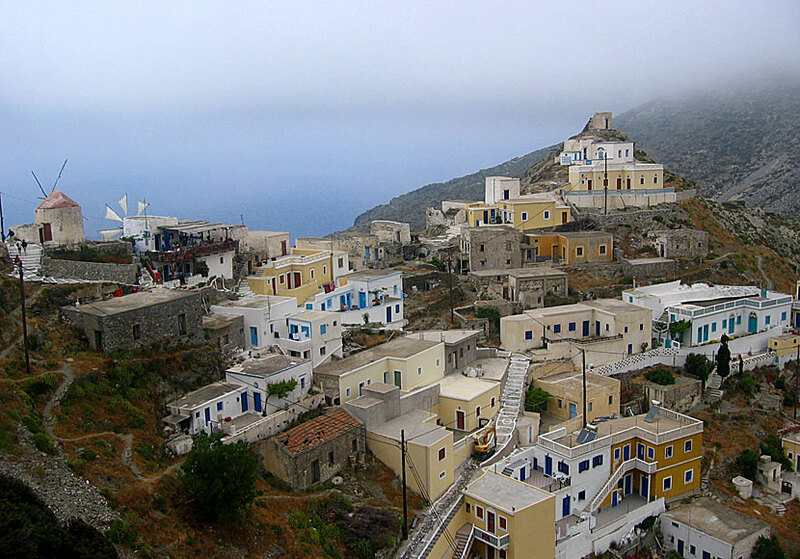 The mythical village of Olympos in Karpathos. Olympos lies about 40 kilometres from Pigadia and about 20 kilometres from Spoa. You get here by your own vehicle, by excursion boat or by bus from Pigadia. ATM are available since June 2017.